Panax’s continued growth is a result of the company’s success in securing and developing conventional geothermal projects in the Asia Pacific region. The company’s development is guided by two key strategies – minimising project exploration risk and targeting attractive power tariffs. Panax only pursues conventional geothermal resources where naturally occurring hot water is found in existing reservoirs beneath the earth’s surface. These geothermal resources, known as hot sedimentary aquifers, have been commercially proven around the world with more than 11,000 megawatts already in operation – the equivalent of 15-20 coal-fired power stations. By focussing on projects using proven technology Panax maximises its success when taking on new projects. There is enormous potential for large-scale commercial geothermal energy development in Australia. But, additional funding and carbon incentives are needed to move projects closer towards commercial operation. 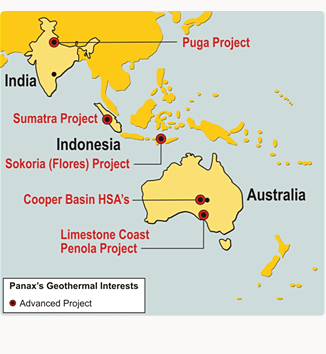 In the meantime, Panax has invested in countries with advanced geothermal industries such as Indonesia where the government provides guaranteed feed-in tariffs to geothermal companies – providing investment certainly not currently available in Australia. Geothermal energy is the only sustainable source of energy which can replace baseload power generated by fossil fuelled power stations, and provide clean energy all year round. There is significant commercial potential for geothermal in Australia and other parts of the world where geothermal power stations have been operating for nearly 100 years. Panax is dedicated to meeting the world’s growing demand for cleaner power and bringing geothermal to the forefront of the energy industry in Australia.